A very long count given the circumstances: seven hours in continuous rain. However, I predicted this would push birds down, and so it did. By the end of the day we had counted a new record number for The Hague: 373 White Wagtails (spec.)! This has contributed significantly to the best ever spring total of these birds, with already over 2000 counted birds on April 3rd, whereas the previous maximum for an entire ‘spring’ period (until July) was only 1561 birds (in 2005). Perhaps not the most spectacular species, but a fantastic number nevertheless! Also, my first Barn Swallow and no less than 3 Little Ringed Plovers. First House Martin for the year and also the first photographed bird for The Netherlands. And a cracking migrating Tree Creeper, taking off right above our heads up to an altitude of around 30 meters and then flying north. Nothing spectacular apart from that. The Netherlands' first photographed House Martin of 2018. Actually my first ever visit to Breskens, The Netherlands' prime migration hotspot in Spring. What a place and what a day! Highlight of the day was an adult Glaucous Gull, a bird I was so flabbergasted to see I forgot to photograph it, despite flying by so close. Incredible record for April and generally in The Netherlands (adults are very rare). Very enjoyable numbers of Meadow Pipits and Barn Swallows, but still really low numbers for this time of the year. Bramblings, on the other hand, were flying in crazy high numbers, with 2215 birds counted in a day, mostly passing in compact groups very close to the counters. My first Purple Herons of the year. Other birds worthy of a mention: my first Purple Herons (finally), a Black Kite I picked up a few kilometers south but didn't come any closer, a Hooded Crow, a fantastic Caspian Tern just before my departure and a Corn Bunting. A curious White Stork flying overhead very closely. I was expecting to see my first for roughly 2 weeks already, and there it was: my first Osprey of the year. As applies to so many other species, a late first. Another Black Kite, 4 Ring Ouzels, a possible Corn Bunting, a ticking bunting that turned out to be a Little Bunting, an oddly sounding Tree Pipit (could be Olive-backed), and a nicely showing Short-Eared Owl. A slow day with quite enjoyable birds in the end. Upcoming Autumn I will be one of four coordinators of the Batumi Raptor Count. To prepare more efficiently for this year's count, we went to Georgia for a week. The week was mostly filled with meetings and administrative work, but there was some time for birds as well. Although we did not do a full-blown count in typical BRC style, we did 2 short counts and there were many birds to be enjoyed. Mostly Black Kites and Steppe Buzzards with relatively good numbers of Lesser Spotted Eagles. On the first day in the village (Sakhalvasho), many thousands of Black Kites passed on the coast. I'm sure if we would have done a count on that day we would have set a new Spring-record on Trektellen. 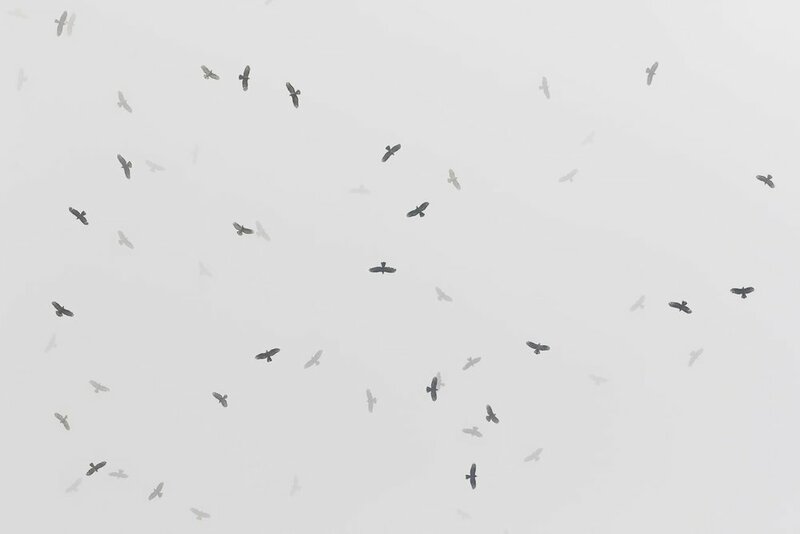 A kettle of Black Kites ‘gloupsing’ into the clouds. Gloupsing (BRC jargon) comes from the sound that you hear when a bird disappears into the clouds, a generally faint ‘gloups’. Of course quite a few Eagles were left unidentified, so could have been Steppe, Imperial or Greater Spotteds. Besides the few Pallids I have seen (3 adult males, 1 adult female), at this time in spring also Hen Harriers are relatively numerous, a species that generally migrates too late to be picked up during the Autumn count. Weather in spring — at least for this week — did not push all too many birds to the coast, so many birds were seen migrating in the mountains, but remained unidentified. I wish I'd get to see more of these beautiful Mediterranean Gulls where I live. Truly fantastic birds! Maybe in the future this will be a more regular sight, as they are progressively colonizing more Northern parts of the country. Photo compilation of a (Common) Cuckoo. A Spoonbill that got a little too close and then got startled by the shutter-frenzy of all present photographers. If you are fancy like a Ring Ouzel, you betcha you're not going to sit in the shade. Not a particularly good count, but some Little Terns a few Raven and a very obliging Ring Ouzel (above) still made for an enjoyable count. Photo compilation of a Common Kestrel (presumably a 2cy male). Six Beaufort westerlies, but a boring count in general, except for a shortly present and singing Grasshopper Warbler and a 2cy Glaucous Gull, a species much less common this winter than in the winter of 2016-2017. 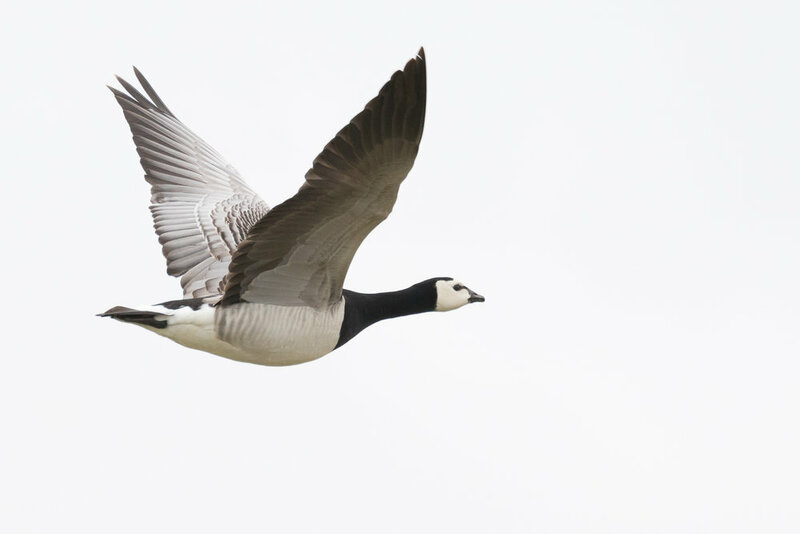 Also, for some reason we have a few pairs of Barnacle Geese flying around often this spring. One of the nicest geese in The Netherlands if you'd ask me, so I had to grab the opportunity for a shot. Southern winds, so most of the birds flew past very high, but I did manage to pick out a few niceties: my first Whinchat of the year, a Purple Heron, a very obliging Northern Wheatear and the first Ortolan for The Netherlands for this year. Remarkably, at the moment of writing (the 5th of May), it still is. We see a decent number of Wheatears migrating past. Oddly enough they very often end up ‘falling’ from the sky and then perching very close to us. Clearly our small dune top seems to attract them, despite having flown hundreds or thousands of kilometers. The local pair of Jays is showing quite well, flying continuously back and forth to and from a presumed nest. The last count of April in overall windless conditions with a sea calm and mirror-like. As a result the Common Scoters that were migrating north could be seen from much further away than usually, resulting in a nice number for April of 668 birds. Also, finally a decent number of Barn Swallows (519). And because I don't want to end without a photo, below is the only bird of the day that was photographed: a species we don't see up close so often, but that is oh so present on our sound recordings.